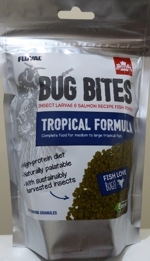 Slow sinking granules for medium to larger fish. Granule size approx 1·5 mm. Composition : Black Soldier Fly larvae (38%), Salmon (20%), fish protein concentrate, peas, potato, wheat, dicalcium phosphate, calcium carbonate, calendula, rosemary. Analytical Constituents : Protein 40%, Fat content 12%, Crude Fibres 5%, Crude Ash 9%. 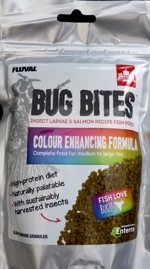 Insect larvae & Salmon recipe food. Slightly higher protein content than the regular granule. Composition : Black Soldier Fly larvae (38%), Salmon (23%), fish protein concentrate, wheat, potato, shrimp meal, dicalcium phosphate, calcium carbonate, calendula, rosemary. Analytical Constituents : Protein 45%, Fat content 12·5%, Crude Fibres 5%, Crude Ash 9%.